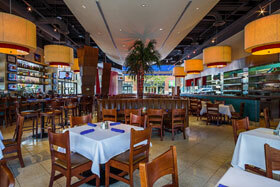 At Cocina Superior we know that your special events vary, so we offer several catering options. We deliver food to groups of 10 or more, ordered off the catering menu ($100 minimum, delivery fee applies), with everything you need for a great meal, including disposable plates, napkins, flatware, and serving utensils. We offer full service, off-site catering and have chafing dishes and other serving pieces for rent when you choose Cocina Superior to cater your party. 24-hour notice is appreciated for delivery orders. If you are interested in having your party on-site at the restaurant, we have our indoor patio area available for up to 100 people. Our indoor patio offers a great view of outdoors, complete with central heating and air, so that it is comfortable year-round. Prices vary depending on the day of the week and the number of people in attendance. Choose from beef, chicken, cheese and veggie enchiladas. Also includes chips, salsa and chile con queso. Includes mixed greens, fajita steak and/or chicken, grape tomatoes, onions, cheese, cripsy tortilla strips, two dressings, chips, salsa and chile con Queso.